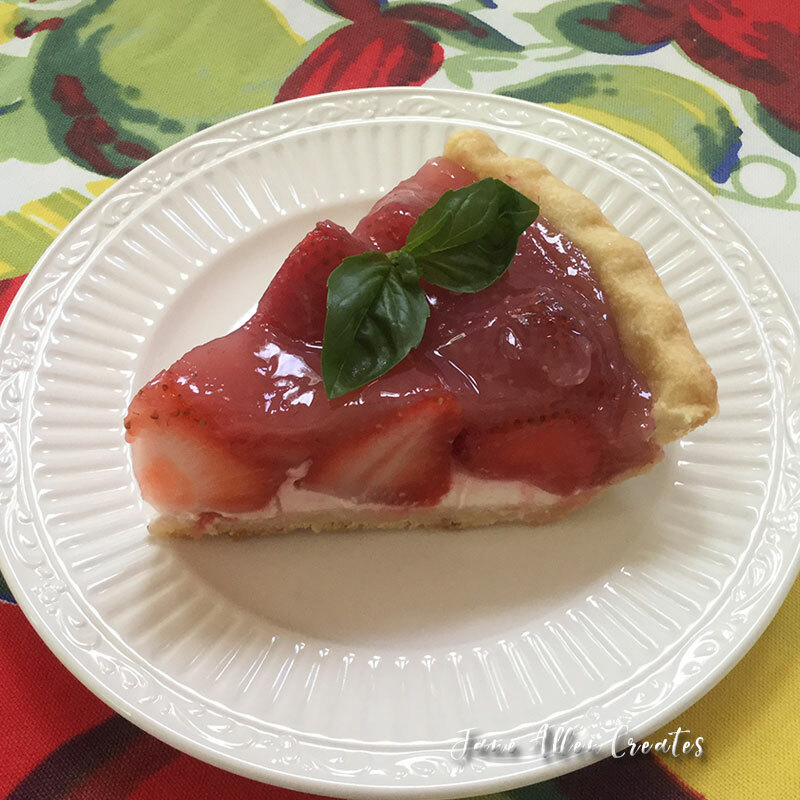 Last week some of my art students brought me some fresh picked strawberries which made us hungry for strawberry pie. Many years ago one of my co-workers made this pie for me. Her husband was a chef and this recipe was from one of his French cookbooks. Thankfully she shared the recipe and I have been making it ever since. Years ago I would mix the crust up by hand, but now I like the east of using the food processor. 6 Tablespoons butter, room temperature. I place the flour, sugar and butter in the food processor and then pulse it five to six times. I then add the egg yolk and 2 tablespoons of cold water and mix until everything is combined. I then pat it into a flat round shape, wrap in wax paper and place in the fridge for about 30 minutes. I like to use a pastry board to roll out my crust and instead of a tart pan I use a 9″ pie plate. Mix the cream cheese and sour cream together and spread on bottom of crust. Wash and decap berries. Mash enough uneven ones to make 1 cup (I put them in the food processor or blender). Mix sugar and cornstarch. Add ½ cup water and mashed berries. Cook over medium heat, stirring until mixture is clear and thickened. Boil 1 minute. Stir to cool slightly. Fill shell with remaining berries, tips up and pour cooked mixture over top.